Honestly speaking, I'm not much of a travelling party animal. I have always tended to be a bit shy when it comes to exploring nightlife in unfamiliar cities and I think I might have wasted my youth away by missing out on the Wild On! experience of intense spring-breaking. But never again. I recently vanquished my (other) white whale of travel frustrations by persuading some delightful company into coming to Budapest with me. After many failed attempts at setting a foot in Hungary, I wanted to be ready for this trip. 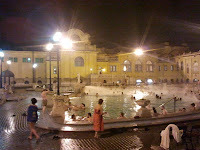 I read Wikitravel and the Couchsurfing forums, looking for insider tips and ideas on what to visit and do in Budapest. I read about goulash, I read about hungarian and how different it is from indo-european languages, I read about the traditional hungarian thermal baths ... and then, I found out about "sparties". Sparties (a not-so-obvious portemanteau between spa and party) or "Magic Bath Parties" are parties that are thrown in the thermal baths, aimed mostly at drunken foreigners (but drunken locals also seem to be more than welcome). The night begins a bit hesitantly. We meet a few Couchsurfers at what seems to be a random tram stop on the bridge over Margitsziget, an island in the middle of the Danube. Meeting up with people that you don't know is always awkward, because you're never really sure what they look like. I stare at them, squinting and trying to recognize them from their profile picture (idiotically, because I only remember details from their profile picture which are perfectly useless, like the fact that in the picture they were eating a gigantic pizza). After you manage to make eye contact, there is that half second of uncertainty, until someone slips "Hi! Are you from Couchsurfing?". An increasingly diverse group of people gathers. Two Swedes who carry around a cardboard box which they insist is a portable bar. A french guy who tells us the story of how he spent a drunken night as one of Budapest's homeless sleeping on the streets because he couldn't find his way back home. A polish girl with a floater. A random assortment of Greeks, Americans, Spaniards... all international students. Some sips of wine later, we're ready to head to the bath where the party will be held. By day, the bath is a rather sterile place intended for people with rheumatic disorders to soak their pains away. By night, lights, steam, electronic music and a bar by the pool transform the bath, maybe not into a Magic Bath, but at least into a Pretty Cool Bath. We slip into our swimsuits, buy a beer and dip a toe into the deliciously warm water. It's a bit decadent, but we're caught in a whirlpool of drunken people swirling around in the swimming pool and don't really care. We swirl around for a few minutes and meet again the french guy, who is making a small fortune by diving into the pool to collect money that was lost by party-goers in the whirling. The night blurs as the music becomes louder, the lights are brighter and more and more people join at the swimming pool. I wake up to a throbbing headache, as if someone had axed me in the head yesterday, as I was leaving the party. My eyes feel hard to open, I'm not sure if it is because of the bright sunshine sneering at us from outside or just because my eyes are crusty. The inside of my body feels dirty with the toxic products of alcohol breakdown and the remaining half-metabolized alcohol still running around my bloodstream. My mouth tastes rancid and I stink. In fact, our entire room stinks due to the two hungover corpses sleeping in it. Water, ibuprofen, sleep. Rinse and repeat. The second attempt at waking up goes a bit better and is soon accompanied by a resurrection shower and a kebab for brunch. We decide to soak away our problems at the Szechenyi baths for the rest of the day and, since we're being so decadent anyway, we might as well get a massage. The Szechenyi baths are on the side of Pest, in a gigantic yellow complex built in the beginning of last century. It is Sunday and the bath is full with wrinkly old couples, young couples, families who come to spend the day here and soak alternatively in warm and cold water. We skip the cold water altogether and wallow in the warm pools. We gloat in the sauna. And by the time the sun sets again, we're back to life.